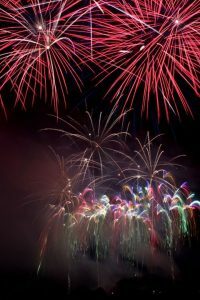 Corporate Firework displays can range to suit many different occasions such as a staff party, celebrating an anniversary or important date to possibly unveiling a new product! Displays can be as short or as long as you require and can be interweaved with other acts, lighting or laser shows. We can design and build custom lancework to display text, images or logos. Using colour effects we can match corporate colours or branding to enhance an image. Using automation equipment we can turn, spin or move the image once again enhancing it should you so wish. So from text on fire, to coloured logos and spinning effects we can custom build a product to suit your unique requirements. With our digital firing system we can fire sequences of effects to create a big build up to an epic moment. Be it a curtain unveiling, building demolition or new years countdown there are a multitude of effects and firing power at our finger tips to create your epic moment. Please don’t hesitate to get in touch as we look forward to the creative challenges you may bring us. Consultation is free, we look forward to meeting you and showing you what we could do.